The over arching goal of the Arizona Game and Fish’s game management program is to protect, restore, and manage game populations and their habitats; to maintain the natural diversity of Arizona; and to provide wildlife-oriented recreational opportunities for all present and future generations. 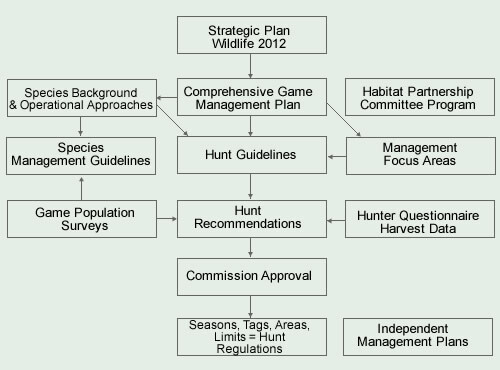 Arizona’s wildlife management is tiered approach, starting with a strategic plan, which shapes the operational plans, and flows into a variety of implementation plans. Many of these elements are vetted through the public process. Geographic Information System (GIS) is an electronic tool that allows the layering of visual data elements like roads, development pathways, wildlife linkage corridors, habitat areas of critical species, and many more elements that have an influence on Arizona’s natural resources and wildlife. The result is an interactive, holistic map that wildlife biologists can use to assist other agencies at the planning stages of their developments, identify critical habitats, and make better decisions to protect, restore, and manage game populations. The above principles, along with a few others, are the basis for North American Model of Wildlife Conservation, considered one of the most successful wildlife management models. Sustainable use of wildlife through hunting and angling are cornerstones of this model, and these activities are the primary funding source for wildlife conservation in North American, including Arizona. Like Arizona, most state wildlife agencies are not funded by state taxes, but from the sale of licenses, tags and a federal excise tax on some of the equipment used by hunters, anglers, shooters and boaters. The Sport Fish and Wildlife Restoration program is from the Pittman-Robertson Act, an excise tax on some hunting and shooting equipment, and the Dingell-Johnson Act is a similar excise tax on fishing equipment and boat motor fuels.